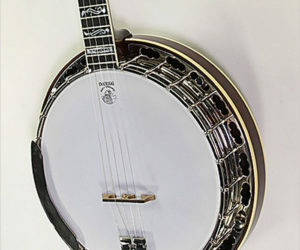 The Deering Tenbrooks Saratoga Star 5-string banjo is really an impressive machine. Visually it is understated, but what’s hidden inside offers amazing tone, responsiveness and versatility. 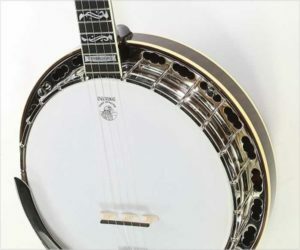 Built using the Jens Kruger tone ring, cast in a bell foundry, the Deering Tenbrooks Saratoga Star features dark-stained curly maple and a gloss finish for the resonator and neck. The fingerboard is bound ebony. From Bluegrass to Country, Rock to Classical, the Deering Tenbrooks Saratoga Star is one of the ultimate banjos made today. This example was built for The Twelfth Fret during 2009 and in excellent condition. It has a custom feature – rather than the standard Tenbrooks ‘D’ neck profile, this has a custom Deering standard shallow C profile. It also has the ’06 Tone Ring option. 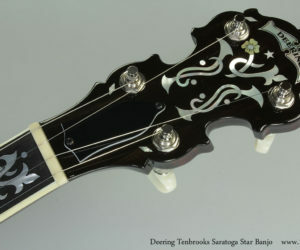 The Deering Tenbrooks Saratoga Star banjo is the top of the Deering line and one of the finest banjos in the world.